On August 22, 2013 The STIC ‘s Knowledge Management Committee meeting was held at the Maria Theresa Meeting Room with the aim to conclude the Knowledge Management (KM) work plan for the academic year 2012, and to quickly suggest/ present ideas about KM plan following STIC’s strategies and objectives for future activities for KM plan in the academic year 2013. 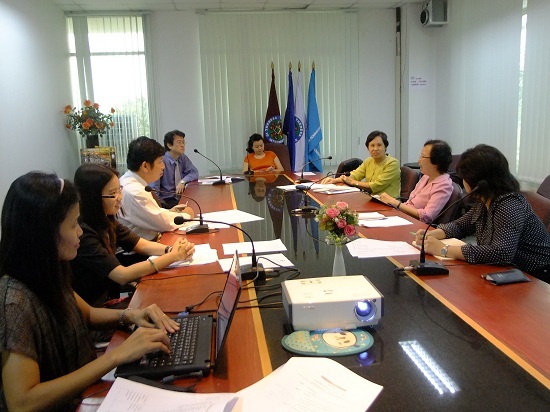 The meeting was led by Chairperson Ms. Phojana Piyapakornchai and Vice Chairperson Asst. Prof. Dr. Poonsoook Kitratkorn and advised by Co-chairs Dr. Piyada Wattanasan, STIC President and Dr. Chapat Wattanasan, Vice President for Academic Affairs. The committee members included Mr. Phitsanu Thepthong of the Office of President, Mrs. Pailin Nichachotisarit of Faculty of Nursing Science, Ms. Wanvisa Saisanan na Ayuthaya of Faculty of Public Health, and Mrs. Suppatchaya Salittanawat of the Academic Affairs Office . The committee convened to brainstorm the plan and considered three of the four KM Focus Areas, more carefully. They were specifically, Learning and Teaching, Research, Educational Plan and Management, and Working system management for the best practice. At the meeting, participants focused mainly on the three main areas; Learning and Teaching, Research and Working System Management for the future operational plan. The “Moodle website” was introduced as a communication channel for learning. Recently, the Faculty of Business Administration, St Theresa International College, organized a Knowledge Management (KM) project to develop techniques and skills in teaching students to think systematically. On February 15, 2013, the Faculty of Business Administration led by Acting Dean Dr. Chaipat Wattanasan, implemented the KM project together with faculty lecturers in order to gain more knowledge and skills in technique development for teaching students. The Faculty applied the teaching model which is based on student-centered learning by using and creating more incentives for the learning process, motivation methods as well as engendering a conducive learning atmosphere in the classroom so that the students could develop their own thinking systematically and effectively analyze lessons and concepts on their own. This KM project was also expected to help support students express their opinions by participating in the learning process and interacting using various learning media, materials and tools to help encourage them to further their studies with higher efficiency. 1. Synthesize the conceptual knowledge to design learning activities which would engage and stimulate the students to learn to think critically as enthusiastic and active learners. 2. Use various teaching methods to stimulate and guide critical thinking such as Question Techniques, Inquiry Methods, Problem-based Learning etc. 3. Give the students time, opportunity and encouragement to think and explore various ways of thinking before they respond. 4. Design assessment/examination questions that emphasize and promote thinking. 5. Implement the steps followed by the lesson plan and monitor the effectiveness. 6. Evaluate the students to see if they demonstrate thinking skills.